Enjoy these costume photos in front of our shop from this year’s Dickens On The Strand®! Special thanks to Mark Charles Dickens, the great-great-grandson of Charles Dickens, for visiting our shop! WITH MORE DICKENS DESCENDANTS, CONTESTS AND FUN!! Galveston Island, Texas, October 9, 2017 – Make history at Galveston’s world-famous Victorian holiday festival, Dickens on The Strand! 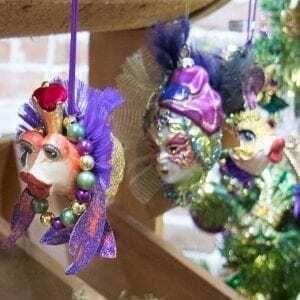 Held December 1, 2 & 3, the 44th annual festival is produced by Galveston Historical Foundation and is a holiday tradition with great family programming, special holiday performances, and newly created events all weekend long. This year’s festival begins Friday, December 1 with free admission to Fezziwig’s Beer Hall from 5 p.m. to 9 p.m. and continues with ticketed admission Saturday, December 2, from 10 a.m. to 9 p.m. and Sunday, December 3, from 12 to 6 p.m.
Tickets purchased before December 1 are $13 for adults and $7 for children ages 7-12. Tickets purchased at the gate are $15 for adults and $9 for youth. Discounted tickets for GHF members are available for $10 in advance or $12 at the gate. Tickets are available online at www.dickensonthestrand.org, by calling, 409-765-7834 or at all area Randall’s stores beginning November 5. Attendees in Victorian costume will be admitted for $8. Three descendants of Charles Dickens will grace the festival as GHF welcomes Mark Charles Dickens, a great-great-grandson; Lucinda Dickens Hawksley, a great-great-great-granddaughter; and Jane Dickens Monk, a great-great-granddaughter. All descendants will be at numerous events throughout the weekend. Featuring specialty acts, award-winning performers and carefully curated food and drink options, this new kickoff to the annual festival is not to be missed! Held at the breathtaking 1892 Bishop’s Palace on Friday, December 1, attendees will enjoy live music by Houston’s Two Star Symphony, a special acrobatics presentation by Cirque La Vie, and appearances by special guests including a reading by Mark Charles Dickens, great-great-grandson of Charles Dickens. Tickets are $75 and reservations are required. What fun is a Dickens festival if you don’t have the characters? This new addition to the wildly popular costume contests puts the focus squarely on the beloved characters from Dickens’ literary works. Held on Sunday, December 3 at 3 p.m., and judged by our visiting Dickens descendants, registration will be open for individual and family costumes. Registration is $10 for individuals and $15 for families. Interested competitors can sign up at the costume contest booth. It’s been called the greatest puppet-based holiday film of all time, and at this year’s Dickens on The Strand, guests can catch a free showing of The Muppet Christmas Carol on Saturday night! Free for all attendees, the holiday classic will show at 7:30 p.m. on Saturday night. The Muppets perform the classic Dickens holiday tale, with Kermit the Frog playing Bob Cratchit, the put-upon clerk of stingy Ebenezer Scrooge (Michael Caine). Other Muppets — Miss Piggy, Gonzo, Fozzie Bear and Sam the Eagle — weave in and out of the story, while Scrooge receives visits from spirits of three Christmases — past, present, and future. They show him the error of his self-serving ways, but the miserable old man seems to be past any hope of redemption and happiness. The great-great-granddaughter of Charles Dickens, Jane Monk, isn’t just coming to this year’s event to take in the sights and share her heritage, she’s also there to cook a traditional English breakfast! Join Jane and our award-winning chef at the beautiful 1859 Ashton Villa on Saturday, December 2 or Sunday, December 3. Tickets are $60 and reservations are required. Dickens descendant Lucinda Dickens Hawksley will lead a special writing workshop, “What It Was Like to be a Child in Dickens’ Time” each day of the festival for youth ages 8 and up. Also, through a special grant from the Alice Taylor Gray Foundation, the first 2,000 youth that enter the festival grounds will receive a special print edition of Charles Dickens’ 1838 Cricket on the Hearth. Mr. Fezziwig was everything Ebenezer wasn’t, and we pay tribute to his jovial personality at our Fezziwig’s Beer Hall. Join us Friday evening, December 1, from 5 to 9 p.m. for specialty acts, hearty brews, and new friends all hosted by Dickens descendant Jane Monk. There will also be a specialty cocktail chosen from Cedric Dickens’ book Drinking With Dickens. Admission is free for this lively start to the 44th anniversary. Could you be the next Dickens? This year’s festival will give you the chance to ride in a carriage with both of our Dickens descendants if your story is the winning selection! Lucinda Dickens Hawksley will personally select two stories, one from a 7-9 age range and one from a 10-12 range, for the winner to accompany them as their special guest during a Dickens parade. Stories are limited to 100 words and can be on one of three topics. Details and submissions are at www.dickensonthestrand.org. Children by the thousands come each year to the parades, petting zoo and more. This year’s event will feature an expanded Oliver’s Alley children’s area, presented by the Galveston Children’s Museum, where specialty programs and events will be scheduled all weekend long. The Texas Seaport Museum transforms to a London wharf for this toast to the end of the day and beginning of the evening. The Tall Ship ELISSA welcomes you aboard Saturday, December 2 at 4:30 p.m. for heavy appetizers, cocktails, cannon fire and special guests leading up to Saturday night’s Pickwick’s Lanternlight Parade. Tickets are $50 per person and reservations are required. The 1859 St. Joseph’s Church, the state’s first wooden built church, well known for its exceptional acoustics, hosts three holiday handbell concerts on Friday, December 1 at 5:30, 7 and 8:30 p.m. Tickets are $15 per person and reservations are required. 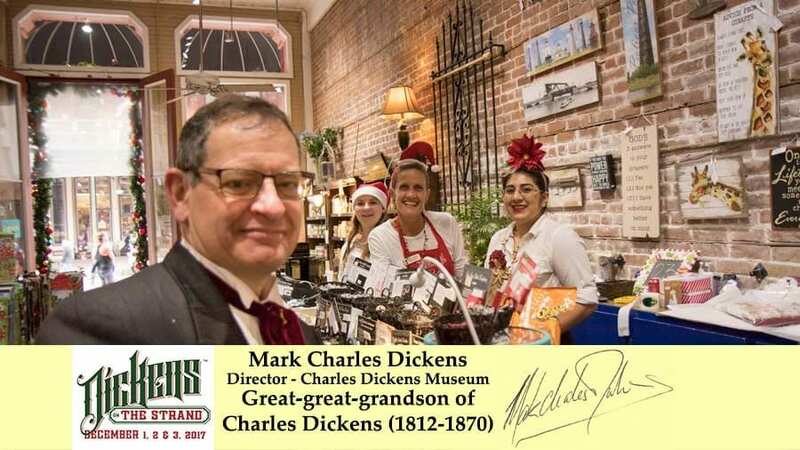 For more information on Dickens on The Strand, Galveston Historical Foundation, or to purchase advance tickets, please visit galvestonhistory.org or call 409-765-7834. For more festival information, please contact Will Wright, Director of Communications and Special Events at 409-765-3404 or will.wright@galvestonhistory.org.